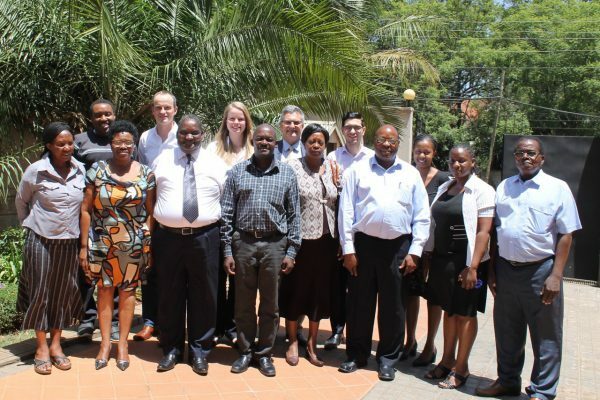 On February 3, the Regional Expert Review Committee (ERC) convened in Nairobi, Kenya to discuss the methodology for the Regional Access to Seeds Index for Eastern Africa. The ERC agreed with the proposed draft methodology, while adding and fine-tuning some of the topics the Index addresses. The draft methodology was developed by Cardno Emerging Markets, under the supervision of the Access to Seeds Foundation. The methodology reflects the expectations of stakeholders in and around the seed industry with regard to the role and responsibility of leading regional seed companies to provide smallholder farmers with quality seeds of improved varieties. Cardno consulted 53 representatives of regional seed companies as well as 41 industry stakeholders. In addition, 17 farmer focus groups were organized in 11 countries to identify the challenges, needs and demands of smallholder farmers with regard to access to seeds. At the start of the meeting, Cardno team leader Dr Joseph Ahenda explained that the region has enormous agricultural potential which is currently not being met. According to stakeholders, this is due to the lack of an enabling environment, varying degrees of government control of the seed sector as well as declining extension services from the public sector. At the same time, notwithstanding the role governments have to play in creating an enabling environment, stakeholders believe seed companies can do more although some are already showing leadership. The top five challenges according to farmers are (1) limited access to suitable varieties; (2) the cost of improved seeds and other required inputs; (3) long distances to seed outlets and irregular and late supply; (4) low germination percentages and (5) poor response from companies to complaints and issues. As a result, the majority of farmers rely on traditional varieties supplied by the informal seed system. Seed companies noted that they are stepping up their efforts by (1) extending distribution networks into rural areas; (2) providing technical support; (3) cooperating with NGOs to provide extension services; (4) developing appropriate varieties and (5) employing strategies to prevent counterfeiting. Based on the input from stakeholders, farmers and companies, Cardno developed a methodology to assess company performance and identify best practices. With the advice and support of the Regional ERC, this methodology will be finalized and presented at a stakeholder roundtable to be held in Nairobi on February 19. The Regional ERC is composed of six regional experts from various stakeholder backgrounds. They are: Stephen Mugo, Principal Scientist, Maize Breeder and Kenya Country Representative at CIMMYT; Dominic Gitau, former General Manager, Simlaw Seed Company; Essau Mwendo Phiri, Chairman, National Smallholder Farmers’ Association, Malawi; Flora Mpanju, Senior Examiner, African Regional Intellectual Property Organization (ARIPO); Dawit Alemu, Senior Researcher, Ethiopian Institute of Agricultural Research; John Kanyuithia Mutunga, Chairman, Kenya National Federation of Agricultural Producers.